Growing up, my grandparents always took my siblings and I on a long walk around the neighborhood after dinner. As a matter of fact, this is one of my fondest and most cherished childhood memories. My favorite walks were those taken during the summer months when it was still bright outside. The warmth gently embraced my skin and the occasional breeze made the vibrant green leaves on huge trees flutter like little butterflies. Every so often, greetings were shared with neighbors reading a book on their porch or watering their front lawn. Other times, my sister and I excitedly squealed and giggled as we ran through sprinklers that spewed water all over the sidewalk. It was that one corner, the corner by the big street next to the dainty yellow house. The second the corner was turned we were welcomed with a strong perfume of orange and lemon blossoms. The scent was intoxicating and uplifting. It made my fingers tingle and my heart skip a few beats. Today, I walk around our neighborhood after dinner with my parents during the summer months. We no longer live in the house I grew up in nor is Gramps here with us anymore. However, every time I walk by a citrus tree and inhale the heavy perfume, I stop for a moment and close my eyes. And suddenly, I feel like I am five again and I feel as though Gramps is standing there with me. At that moment, my childhood seems so vivid and, in a sense, almost tangible. This Lemon Citrus Cake is for Gramps. STEP 1: Choose a round cutter of your choice. Now choose a cutter directly one size up or down. Using the bigger of the two cutters, cut out a piece of white sugarpaste—this will be the base on which you will build upon. STEP 2: Again, using the bigger of the two cutters cut out a piece of yellow sugarpaste. Using the smaller cutter cut the center out of the circle. Glue the yellow ring onto the edge of the base piece—this is the peel of the lemon. STEP 3: Cut out a white circle using the smaller cutter—this is the center of the lemon. STEP 4: Roll out a piece of yellow sugarpaste. Using a rose piping tip, gently leave imprints all over the sugarpaste—this will be the pulp. STEP 5: Using a teardrop cutter, cut out a few holes in the white center piece. These are the cavities for the yellow lemon segments. Using the teardrop cutter, cut out segments from the yellow sugarpaste. Insert into the cavities in the white center piece. Let it sit for a few minutes. STEP 6: Wet the center of the base and insert the center piece to complete the lemon. Dry for a few hours or overnight and it will be ready to use! 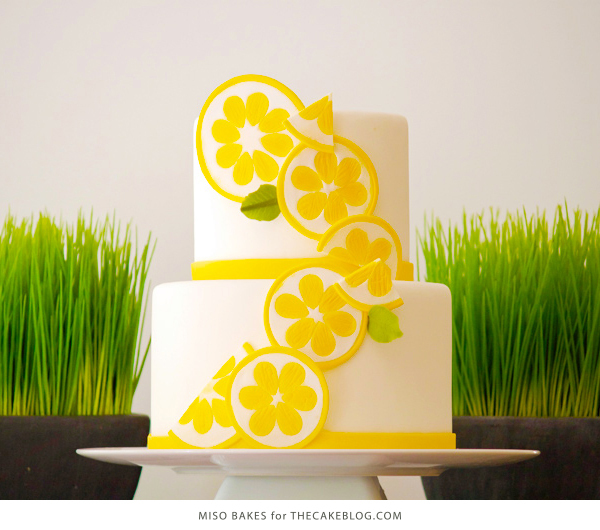 Use the lemon slices to decorate cakes or use as cupcake toppers! To make limes or oranges, simply swap out the yellow with green or orange. Miso is based in Los Angeles where she is a cake designer and teacher. She also travels internationally to share her craft and passion with others. Thank you for this tutorial, it’s absolutely wonderful. Such a fresh-looking cake. Awesome! I love this technique. I want to make a lemon pound cake right now! Thank you! Oh, great DIY! That’s so helpful, thanks! Awesome cake! Your designs are always so beautiful – simple, elegant and of course delicious looking! Wow, your timing could not be more perfect. I was asked just last night to make my very first cake to be sold! (I normally just give them away as gifts) I was overwhelmed and excited by the idea and the client has asked for my lemon cake. I have been wondering what I would do to the outside of the cake and I think I just found my inspiration! Thanks so much! Love, love love this cake! Simple, elegance…. This took my breath away! 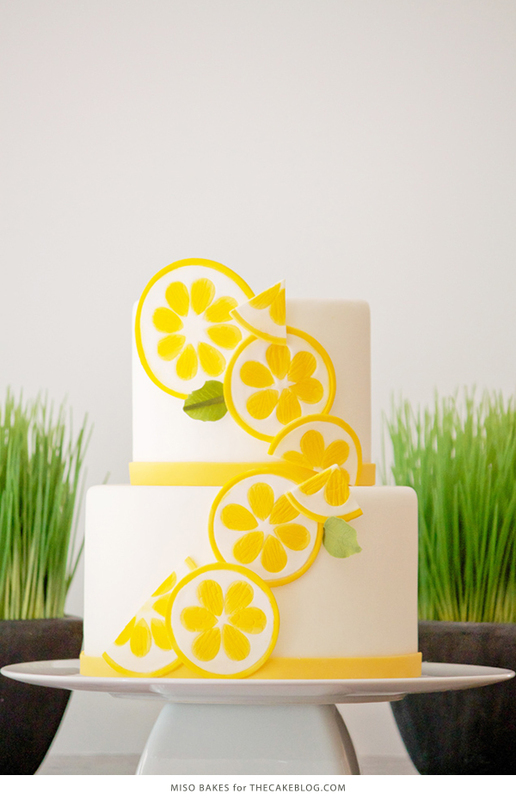 Love how crisp the lemons look against the simple white cake. Would this work with fondant? Awesome!!! Thanks for sharing. I will definitely add this to my list of cake designs to do! I did a version of this for my final cake in a decorating class – it was so much fun. Thank you! Beautiful! I made a lemon cake very simple but good :-)perfect for summer. miso!! that is the cutest cake, i love the look of the lemon slices, too with the beautiful texture! my grandpas are no longer here, either – if i could make an homage to one of my grandpas, he loved ketchup more than humanly possible – he would put it on slices of honeydew! so i guess i’d make a ketchup melon themed cake! hi I love your tutorial, I want it to ask you which petal cutter did you use?? to make the inside of the lemons? ?